Almost any document you sign as part of your divorce proceedings would – or should – include a warning at the end where you place your signature. This language indicates that whatever you've stated in the document is true, at least to the best of your knowledge, and that you're stating so under penalty of perjury. It's included in the financial affidavits that states typically require as part of a contested divorce process, as well as affidavits you might submit to the court to support a motion you've filed for temporary relief during the divorce proceedings. If you place your signature on any of these documents and the information you enter is untrue, you may perjure yourself, but some gray areas exist. If you make a statement that you believe to be true, or is true at the time you sign the document, this isn't perjury. For example, if you own stock worth $45,000 at the time you sign your financial affidavit and it skyrockets to $100,000 the next day, you have not committed perjury. You would only have lied for perjury purposes if you signed the document after the value increased and even then, depending on the timing, it might be an honest mistake – you might not have been aware of the change. Your spouse or the court would have to prove that your misstatement was willfully false – you spoke it or committed it to writing knowing it was untrue. Generally, your lie or misstatement must materially affect your divorce case to be punishable as perjury. This means that it somehow changes the outcome of the divorce. For example, if you sign an affidavit that explains why you should be granted temporary custody instead of your spouse and you state that you were at work at the time an important incident occurred but you were actually home, this is not likely to be treated as perjury if your whereabouts had no effect on the situation. However, if you state in your financial affidavit that you have an account at only one bank when, in fact, you also use an out-of-state bank because you don't want anyone to check on the balance, this is material because it has a direct impact on your case. 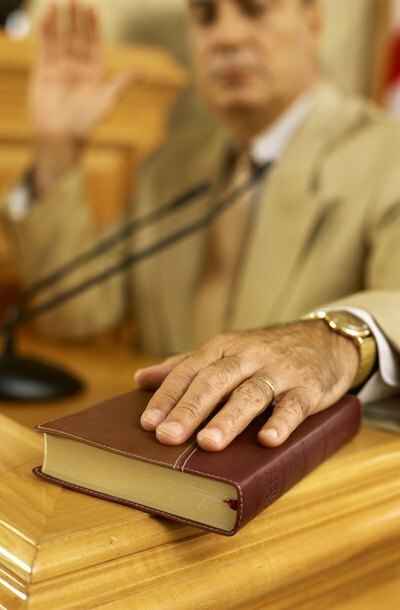 If your false statement was both willful and material, you may have a legal problem. If the court decides to prosecute you, you could be liable for a fine of several thousand dollars and possibly even jail time, depending on your state's laws. More likely, however, it will have an effect on your divorce proceedings, and not to your benefit. If your spouse finds out you lied after your divorce is final, she can petition the court to reopen the matter and retry it based on the true facts. The court will probably grant her request and it won't look favorably on you in the second proceeding. If your misstatement comes to light during your divorce proceedings, the court can rule against you, particularly with regard to division of assets and debts. Both spouses usually file an affidavit at least once during a divorce proceeding. An affidavit is a written and signed statement that swears to information for legal purposes. Affidavit types vary in a divorce case. You might need to file a financial affidavit -- a statement of the current household finances -- during a divorce or provide an affidavit confirming your petition or the divorce grounds.